A near-contemporary of the Jowett Javelin was the Cemsa Caproni, designed by Antonio Fessia for the Italian aircraft manufacturer. The plan to move into car manufacture was abandoned not long after production started, and only two examples are thought to survive. 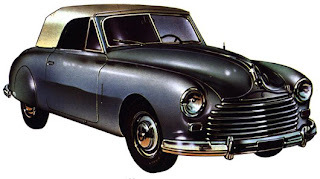 The similarities to the Jowett are clear, flat four engine and conspicuously aerodynamic coachwork, although the Cemsa had front-wheel drive, and an engine capacity of only 1100cc. 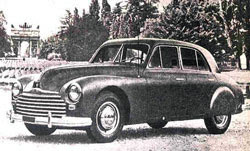 We may lament that Cesma never had the opportunity to become Italy's Saab or Bristol, but at least the Caproni’s designer had the opportunity to use the experience later in his career, as it provided the template for the design of Lancia Flavia launched in 1961, by which time Professor Fessia was head of the Turin manufacturer's Central Technical Office.